In the audio clip below, Tamari highlights the relationship building process between Creative Time and the artist. Creative Time’s work is guided by three core values: art matters, artists’ voices are important in shaping society, and public spaces are places for creative and free expression. 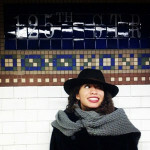 Leila Tamari joined Creative Time in summer 2011 upon completion of Creative Time’s Programming Fellowship program. Leila received her B.A. from Smith College in Art History with a Museums Concentration. At Smith, she collaborated with artists Rick Lowe and Wendy Ewald in Amherst, Massachusetts, and was thus inspired to produce public art projects on a larger scale in her native town–New York City. With a budding passion for exploring public art practices globally, Leila presented her research on public art spaces in Israel and Palestine at the 2011 Social Theory, Politics and the Arts conference.